From discussion on Cyrus Mistry floating a venture capital firm to incubate new businesses to presentation on ITC group. Finally, a melodramatic video showcasing of one’s corporate citizenship relationship – the News Watch #3. Event at IPER’s Management Courses Campus was a platform for discussion the state and future of business and economy of the Nation. 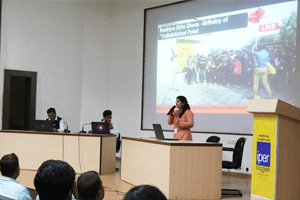 Event took place in the auditorium on 14th Nov 2018 where students of MBA batch presented and participated actively. 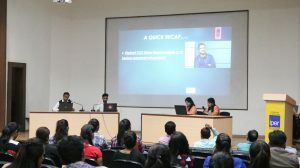 The News Watch series under Management Events at IPER this year is an event in which the students compile and update their students’ owned news website of IPER, and then they present the news for discussion in the Auditorium on the day of the event. IPER organizes this event every fortnight along with other management events. Indian Government took the decision on varieties of Chinese steel under the imposition of Anti-Dumping duties. Safeguarding of domestic players in steel manufacturing in India was the reason of this step. Earlier, DGTR conducted an Anti-dumping investigation. On the basis of the jointly-filed applications from various steel players in India. The news about the anti-duping duties imposed on Chinese steel can be read here. A new venture floated by Cyrus Mistry – one of the richest in Barclays Hurun India Rich List 2018. However, Cyrus Mistry was the former Chairman of Tata & Sons and was in news earlier for his untimely exit from Tata Sons. This new venture is promoted by the two brothers Cyrus and Shapoor Mistry. Moreover, this news on Cyrus Mistry launches a new venture is available on IPER’s students News website. Corporate presentation on ITC Group and discussion on various other business and economic happenings took place. Lastly, a melodrama video on corporate citizenship responsibilities ended the event.